A University of Florida researcher became the first scientist to achieve genome-scale sequencing and analysis of fragile marine creatures at sea aboard a ship and in real time. The genomic sequencing of potentially thousands of marine species had been impossible until now because their fragile genetic material could not be stored or shipped reliably. Sequencing, too, used to take days. But using an at-sea full-equipped genomic laboratory and UF’s powerful new HiPerGator supercomputer, Leonid Moroz has opened the floodgates to discovery. The potential benefits are great: about 50 percent of drugs today are derived from natural products. The globe is 70 percent ocean, and scientists estimate 14 million to 20 million compounds remain to be discovered at sea. 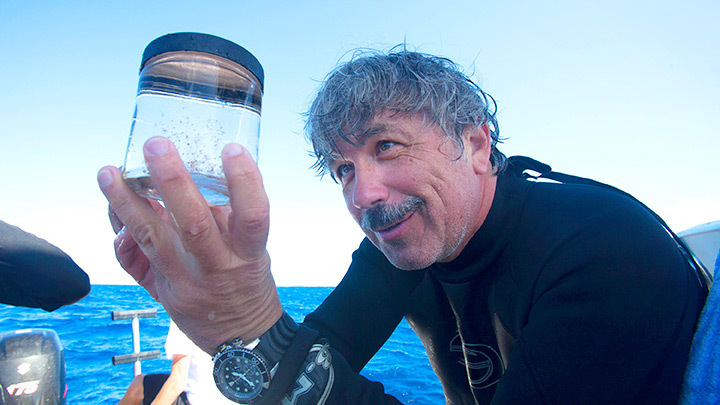 “It is possible now to get the genomic blueprint of all animals in the sea,” said Moroz, a distinguished professor of neuroscience, genetics, chemistry and biology at UF’s Whitney Laboratory for Marine Biosciences, McKnight Brain Institute and College of Medicine. “And this is not science fiction. But science must make haste: the planet loses a species every six hours. Moroz studies fragile marine pelagic organisms – comb jellies or ctenophores – for their ability to regenerate. Their wounds can heal in two to three hours and they can regenerate their elementary brains in three to five days. Another creature, sea slugs, may hold the key to the genomic basis for memory and neuronal evolution. While humans have learned to slow the progress of some diseases, Moroz said many sea creatures have already figured out how to reverse disease and injury. In a quest to speed the pace of discovery, Moroz went to sea. Aboard the Copasetic in early February and later in March-April 2014, within less than two weeks combined, Moroz’s team was able to perform transcriptome sequencing of 22 organisms, among them rare comb jellies. From the outset, each of these trips was a scientific adventure. Together with researchers at Bimini Shark Laboratory and Florida Biodiversity Institute, he planned to biopsy a hammerhead shark for cells, but on the first day no hammerheads showed up. More aggressive bull sharks did. As he was scanning the water he spotted a unique species of comb jelly, so as other crew members kept the bull sharks occupied, he jumped in to collect the comb jelly. The jelly was too fragile for tools, so he used a plastic bag to scoop it up. Two minutes later, he saw another species of comb jelly, not yet investigated rarely seen. Back on board ship, the samples were immediately processed and sequenced using the Ion Torrent Personal Genome Machine System, which was linked via satellite to UF’s new high performance supercomputer, HiPerGator, “and bingo, we had the data,” Moroz said. Moroz said he was motivated to prove direct sequencing and real-time genomic analysis in the middle of even a rough ocean would work because of past frustrations with field expeditions. The creatures that can be shipped to a lab often arrive in degraded condition. Oversampling to compensate for those errors is a problem, too, because it leads to “killing these beautiful creatures.” But without enough samples to repeat experiments, researchers must undertake another costly field expedition. The ideal, he decided, was to combine field work with lab work. UF alumnus and engineer Steven Sablotsky of Miami designed and donated the use of his 141-foot yacht for two trial runs, also supported by the Ocean Research Corp., the Florida Biodiversity Institute, LifeTechnologies, the Florida Museum of Natural History , International SeaKeepers Society, NASA, NIH and NSF. Moroz also teamed with Gustav Paulay, the leading expert in tropical biodiversity and a curator of the Florida Museum of Natural History, who joined the trips. The first results of the sequencing at sea (Moroz named it Ship-Seq) were presented at the international conference, Advances in Genome Biology and Technology, held at Marco Island in Florida in February. While Moroz was delighted with the outing – “the science worked perfectly” – he was just as gratified by the success of the collaboration with multiple partners. The Gator flag flying from the mast was a conversation starter everywhere they docked, Moroz said, and led to opportunities to spread the word about the importance of research at sea. When he explained the high stakes, people often asked how to help. “My hope is to seize the momentum and together with our colleagues at private organizations to develop a series of expeditions over a year or two. We could double our knowledge of the ocean,” Moroz said. Moroz said science, technology and computing power have all converged, leaving researchers on the brink of new discoveries. He points out that the 10-15 year Human Genome Project, which mapped all human genes, took $3.5 billion and hundreds of sequencing machines. Today, the genome of one person will fit on a chip the size of a palm or less, and can be sequenced in 2-3 days for about $1,000. “We are in the midst of a genomic revolution,” Moroz said. “Right now is the right time. We must take advantage of this great new computing facility. We are in a race to save species; in 20 years some won’t exist. Losing them would be like losing the Sistine Chapel.